Most people don’t think about their nails having a direct correlation to their your health, but our fingernails can alert us of the presence of disease and state of health. Take a closer look at your nails, examine each one very carefully. Analyze the curves, wrinkles, dips and ridges. See if they are incomplete or cracked, how thick and thin they are. Notice the skin under the nail and around the nail, and its color. Remind yourself to assess your fingernail health frequently. 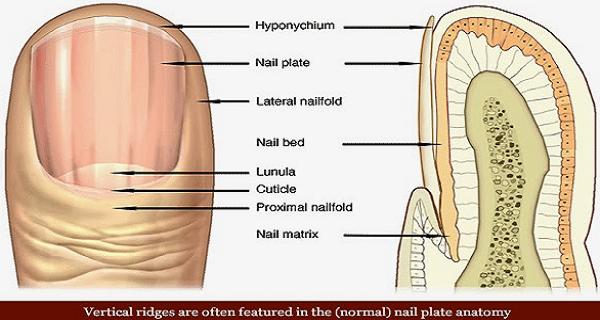 Changes in our nails should be taken seriously, because this can be a warning for many diseases. Take a look at the list of 8 potential health warnings, and compare it with the current state of your nails. If you have healthy fingernails, they will have pink color with a touch of pinkish white moons at the base. Otherwise, if they are streaked with other colors, you may have hidden health issues. Give your nails a good scrub and take a good look at them to assess appearance and thickness. Thickening nails can implicate other health symptoms, such as allergic reactions to some medications. When the issues are gone, the nails will return in their normal shape. Small gouges and dips can be caused by banging up your hands. They can also alert you to look closely at your health state. They can be related to psoriasis, connective tissue disorder, alopecia areata which is autoimmune disorder that results with hair loss and lack of zinc. Look at your nails carefully; divide the natural holes from the real, lasting pits. The natural ones will be disappear quickly, but the pits can be linked with some disease. If your nails are smooth with latent lines, they are healthy. But if you have noticeable ridge lines, this can be a sign of problems. Heavy ridged lines can be related with: lack of iron, inflammatory arthritis and lupus (for red lines at the base of the nails). You may not necessarily require lotion or cuticle oil for this problem. You should know that dry and brittle nails are related with hormone levels and bacterial health.  Fungus makes nails dry and breakable. According to the American Academy of Dermatology, 12% of Americans are affected. You may not notice and differences until after a full nail growth cycle since thyroid and fungal problems require time to treat. Your fingernails are not be the only warning signs for these diseases, however you should never ignore them, so examine them frequently.